We stayed at this hotel for a family get-together in December of 2014. There are two Holiday Inns in Red Deer but this is the one located at 37471 Hwy 2 South, Red Deer, AB. It is visible from Highway 2. We stayed here with a group of twelve people, so we got a good feeling for what the various rooms were like and for what different people’s experiences were. 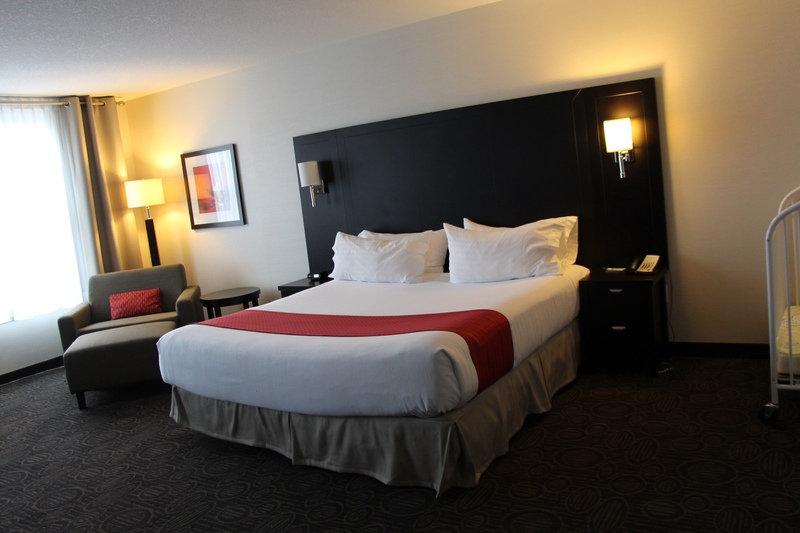 This is a newer hotel and, in my opinion, is currently the best place to stay in Red Deer. 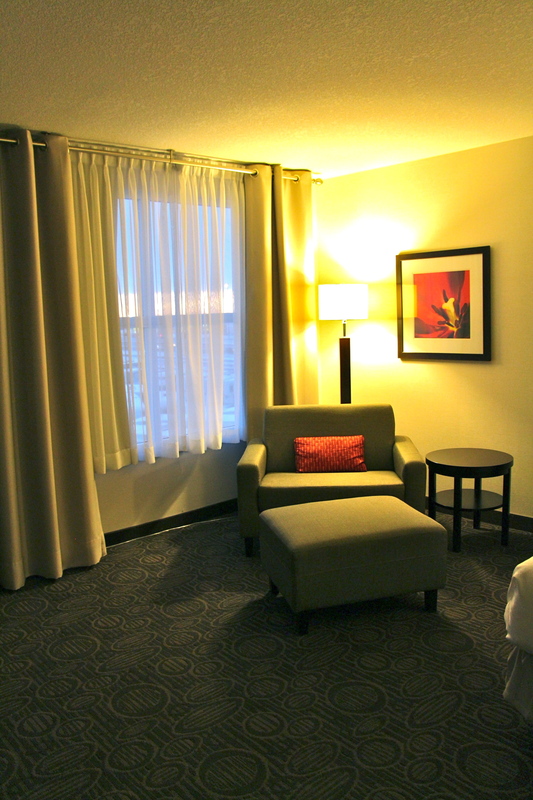 The hotel is easy to access right off of Highway 2, whether you are coming from Edmonton or Calgary. There was ample free parking and check-in was a breeze. 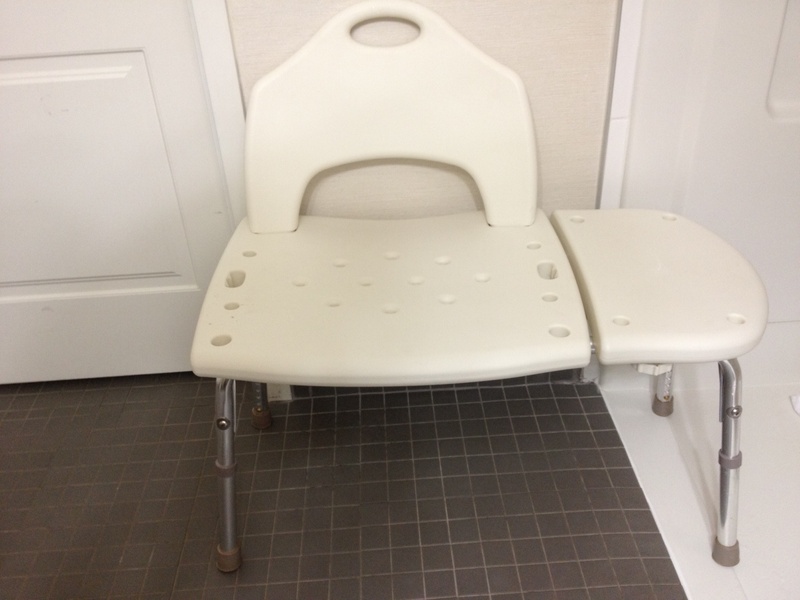 We had no issue getting the two cribs that we needed for our kids. We also had no issue getting rooms on the same floor as the rest of our family so that we could be close by. I understand that there are two fully-accessible rooms at this hotel. The accessible room we stayed in (room 303) was absolutely massive! There was a king-sized bed, a huge chair and ottoman, a desk, a dresser, a flat-screen TV, a mini-fridge, a microwave, a Keurig coffee machine, an iron and ironing board and a large accessible bathroom. The room itself had a huge living area with lots of space for the kids to run around and play. 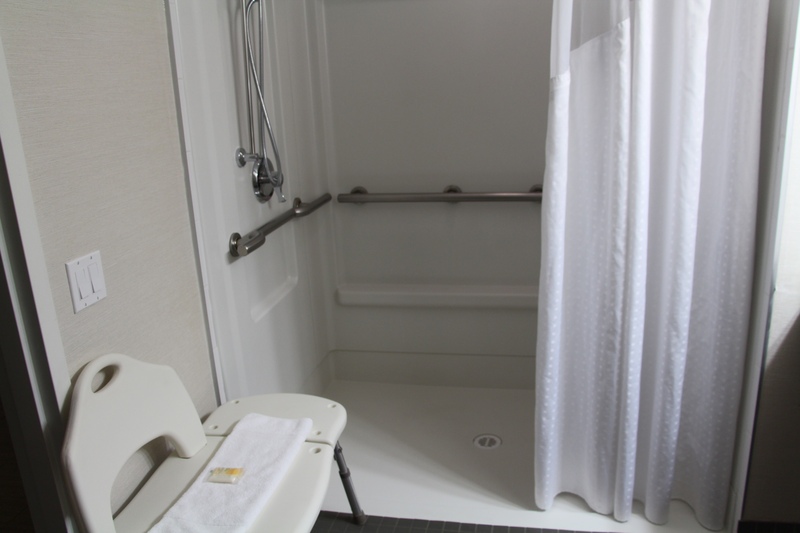 In the bathroom, there were grab bars by the toilet, there was a wheel-under sink and there was a large wheel-in shower with grab bars and a portable shower bench. The floor in the bathroom was tiled and there was a drain in the middle of the floor in case you are like me and happen to soak the bathroom while showering. 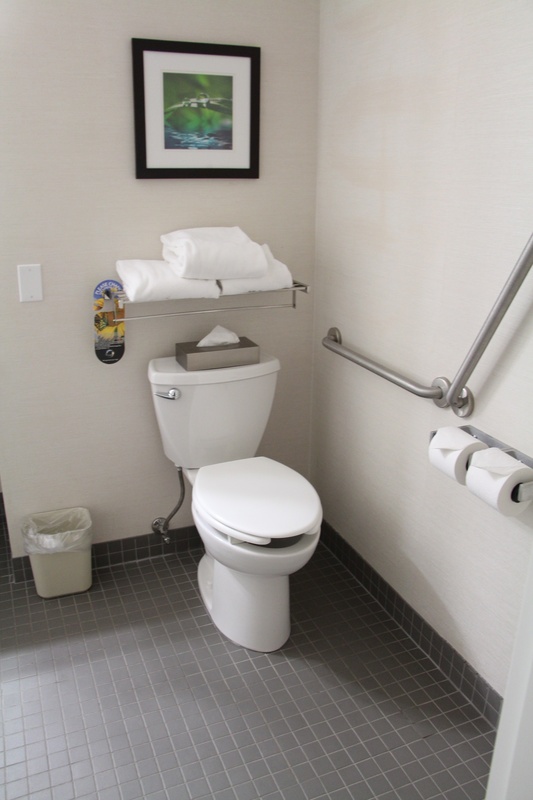 There is a wide variety of non-accessible rooms at this hotel as well. I have stayed here before with my niece and nephew in a room with bunk beds for the kids. One couple in our group got upgraded to a room with a jacuzzi and fireplace, which was very nice. The room with two queen beds is standard and pretty much exactly what you would expect from a traditional hotel room. There was a large, warm pool at this hotel with a waterslide which was great for the kids and adults alike. There was a large hot tub as well with jets that could be turned on or off. The pool area was located on the main floor just off the lobby and it was accessible by wheelchair. There were stairs in the pool and the hot tub that a wheelchair user could bounce down on in order to ease into the water. There is a 24-hour gym at this hotel that can be accessed in a wheelchair. It is mostly equipment but there is room to do some free weights (available in the gym) or exercise bands if you travel with those. The restaurant at the hotel (same floor as the lobby area) was really amazing. It was called Boulevard Restaurant & Lounge and the food at lunch and dinner was very impressive. We learned when we were there that the chef at this restaurant has won awards for the food and it is not surprising when you see the presentation and experience the food for yourself. Prices range from about $10 to $17 per entrée. They have one area full of booths and another area of tables, so they can easily accommodate larger groups and they regularly served our party of 12 with no problems. Kids eat free at this restaurant if you are staying in the hotel. You have to ask for coupons from the front desk that you present to the wait staff in order to get the free meals. The kids’ menu consisted of grilled cheese sandwiches, chicken fingers, pizza, burgers, mac and cheese or grilled chicken. Each meal came with a drink and a side of fruit, veggies or fries. For dinner the kids even got free ice cream. At breakfast, the kids were able to choose from yogurt and fruit, pancakes, eggs and bacon, or oatmeal and fruit. The portion sizes were quite substantial. The hotel was very clean. There was not a single time I passed through the lobby that I did not see someone mopping. The pool maintenance staff checked and tested the hot tub every time we were in the pool and it appeared that the staff was really on top of the cleaning. 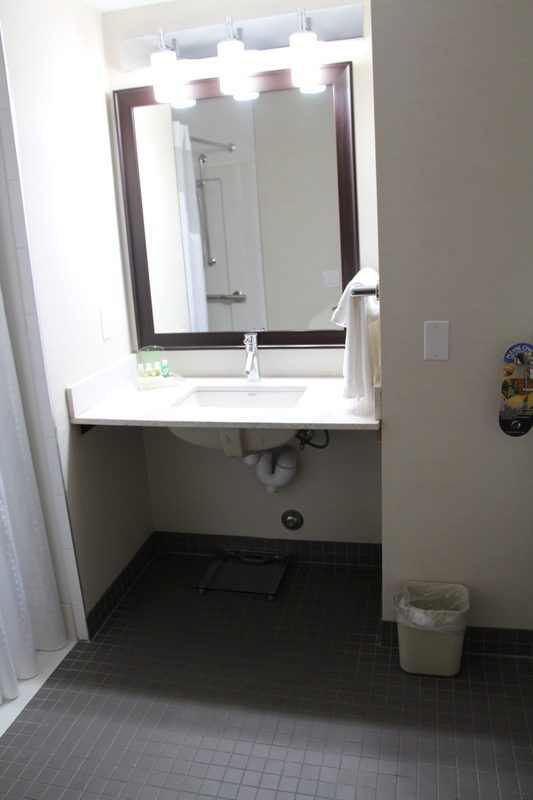 In terms of accessibility, the only bad thing was that the sink in the wheelchair accessible room was too deep. There was no foam on the bottom of the sink to provide a protective barrier either, so you would have to be very careful when using hot water not to burn your legs. We did mention this to the hotel and they indicated they would look into placing foam on the bottom of the sink. The waterslide in the pool was very fast. And by very fast, I mean probably one of the fastest hotel pool slides I have ever been on. Some people liked it and it was too fast for others. There is nothing ugly about this hotel. This is a nice, new hotel located in a very convenient spot just off the highway. 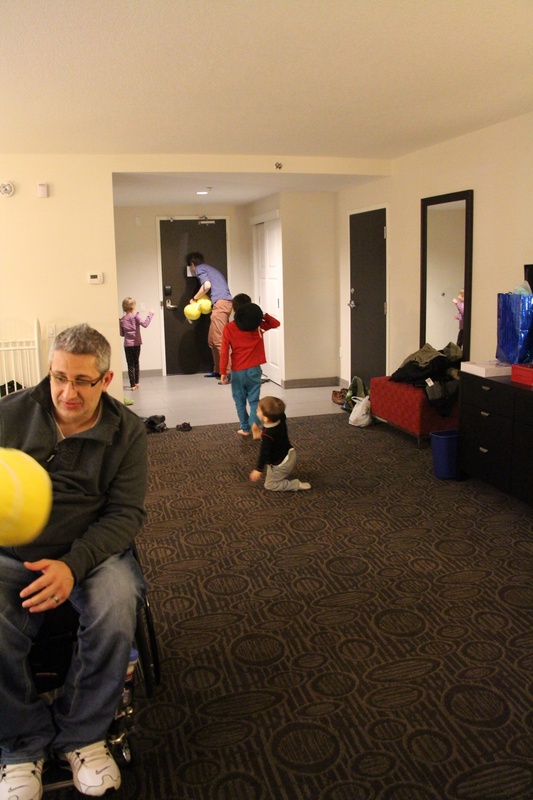 I highly recommend this for a stay in Red Deer, whether you are in a wheelchair or not and whether you are travelling alone, as a couple or as a family.